Like a good neighbor, Fred Rogers was there. Every day, with a cardigan to wear and a lesson to share. Way before you and all your fake teleportation and spontaneous manifestation of sandwiches and giant stuffed pandas, State Farm. So it's surprising that The Good Neighbor: The Life and Work of Fred Rogers is the very first full-length biography of the man who only ever had beautiful days in the neighborhood, out now perhaps to commemorate the 15th anniversary of Mr. Rogers' death. 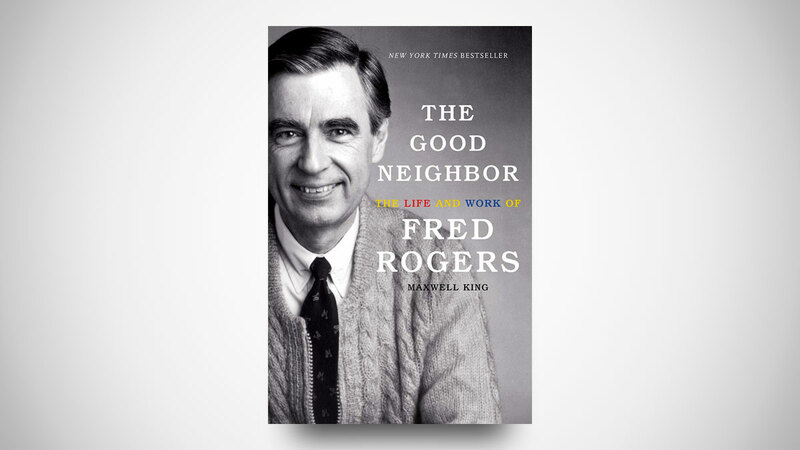 Former journalist Maxwell King authored The Good Neighbor: The Life and Work of Fred Rogers with the help of original interviews, oral histories and archival documents. I bet he also binge watched every episode of Mister Rogers' Neighborhood. Anyone with nostalgia for their favorite childhood show of the 60s...and 70s...and 80s...and 90s! (Mister Rogers' Neighborhood is second only to Sesame Street as the longest running TV show of all time) can grab a copy of < i>The Good Neighbor, and hop on the trolly to the land of Not-Make-Believe to get an in-depth look at the life of Fred Rogers, maybe the kindest and most compassionate neighbor of all time.